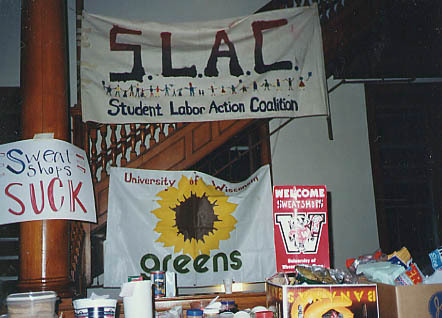 The first Student Labor Action Coalition (SLAC) was started at the University of Wisconsin-Madison in 1994 to support the struggle of workers at the A. E. Staley corn processing plant in Decatur, Illinois. Workers had been locked out of their plant after the company refused to continue contract negotiations. The workers' struggle became a watershed event in the rebuilding of a nationwide, fighting Labor Movement. Their fight became a "cause celebre" with activists across the country sending material aid like food and money, travelling to Decatur for rallies, and attacking A.E. Staley anywhere they could. The struggle lasted over a year but, sadly, the workers lost the battle when their International negotiated a deal with the company to force them back to work. Madison SLAC dissipated not long after the struggle ended. In November 1997, the South Central Federation of Labor's (SCFL) Organizing Committee (OrgCom) began rebuilding Madison SLAC. After many years of declining membership as the nation de-industrialized and shifted to a service economy, the Labor Movement finally started to focus on organizing the unorganized again. Changes in the AFL-CIO and some International Unions like the Service Employees International Union (SEIU) had created a serious demand for new field organizers. While many organizers were recruited from the rank-n-file, many more were needed to fill positions nationwide. 2). Get students involved in direct Labor Solidarity work. 3). 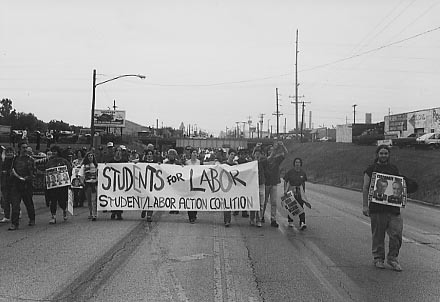 Recruit students into the Labor Movement as organizers or rank-n-file activists. The original core group included Joe Mingle (AFSCME Local 2412) and Joel Shoemaker (IBEW 159) representing SCFL and students Chris Babiarz, Noah Greenberg (a member of the first SLAC), Erin Fishman, Jenny Capellaro, Melissa Maley, and Samantha West. 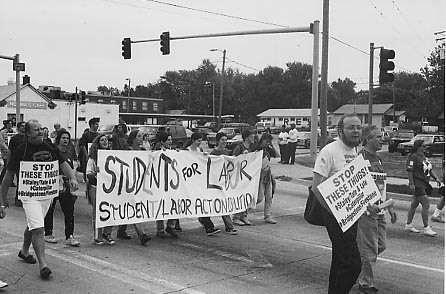 SLAC's early projects included recruiting students for the AFL-CIO's Organizing Institute and SCFL's Organizer Training. SLAC assisted SCFL in organizing a large Equal Pay Day Rally and Speak Out at the Capitol April 3, 1998. Slogans on the poster and press release included "Economic justice for all! ", "Equal Pay for Comparable Work! ", "Defend Workers' Rights and Civil Rights! ", and "Stop W-2 Abuses of Children and Low Income Workers!" Heading into the Fall of 1998, SLAC continued to recruit students for the AFL-CIO's Organizing Institute and SCFL's Organizer Training and support the Org Com's work. In addition, SLAC assisted AFSCME Local 171 with their campaign against Limited Term Employee (LTE) abuse on campus. Anti-sweatshop activism was already sweeping the country and SLAC worked with the UW-Greens, the Alliance for Democracy, and the Madison Anti-Sweatshop Committee to organize Holiday of Conscience protests at WalMart. 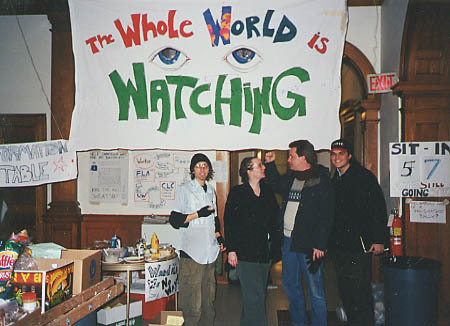 SLAC activists also participated in the first anti-sweatshop sit in at Bascom Hall in February 1999. During that year, SLAC grew to include additional members - Katie Muehlenkamp, Matt Anshus, Joel Penegor, Brian Rothgery, and Bob Hemauer. 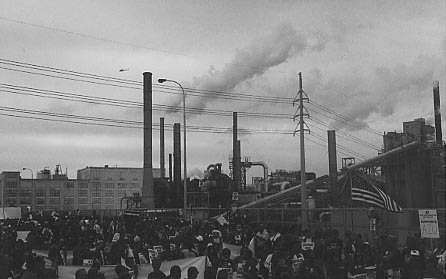 That same Spring, SLAC members attended the Detroit, Michigan Labor Notes Conference in April and assisted the OrgCom, Pace Local 1202, and the United Steelworkers of America (USWA) with leafleting at select local factories.